Make sure that you don't stuff your pet with food or give it too much water, however. 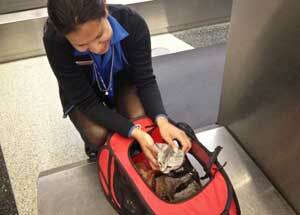 A pet with a full belly aboard an airline flight may vomit from anxiety or travel sickness. Too much food or water can also lead to accidents inside the crate; not a pleasant way to fly. You'll also want to make sure your pet's food and water bowls are empty and locked inside the carrier, with a bag of food attached to the outside of the carrier. This will prevent spills and will give airline employees a chance to feed or water your pet, if necessary, during a long delay or layover [source: Petco].